Six years have passed since the outbreak of severe acute respiratory syndrome (SARS). Previous studies indicated that specific Abs to SARS-related coronavirus (SARS-CoV) waned over time in recovered SARS patients. It is critical to find out whether a potential anamnestic response, as seen with other viral infections, exists to protect a person from reinfection in case of another SARS outbreak. Recovered SARS patients were followed up to 6 y to estimate the longevity of specific Ab. The specific memory B cell and T cell responses to SARS-CoV Ags were measured by means of ELISPOT assay. Factors in relation to humoral and cellular immunity were investigated. Six years postinfection, specific IgG Ab to SARS-CoV became undetectable in 21 of the 23 former patients. No SARS-CoV Ag-specific memory B cell response was detected in either 23 former SARS patients or 22 close contacts of SARS patients. Memory T cell responses to a pool of SARS-CoV S peptides were identified in 14 of 23 (60.9%) recovered SARS patients, whereas there was no such specific response in either close contacts or healthy controls. Patients with more severe clinical manifestations seemed to present a higher level of Ag-specific memory T cell response. SARS-specific IgG Ab may eventually vanish and peripheral memory B cell responses are undetectable in recovered SARS patients. In contrast, specific T cell anamnestic responses can be maintained for at least 6 y. These findings have applications in preparation for the possible reemergence of SARS. Severe acute respiratory syndrome (SARS) is an emerging infectious disease that caused a global epidemic in 2003. Clinical manifestations, laboratory findings, radiological presentations, and outcomes of SARS patients have been well described (1–3). Six years after the SARS outbreak, an important question has received wide attention: will patients recovering from SARS present a protective response against reinfection in case of another SARS epidemic? Previous studies indicated that specific Abs to SARS-related coronavirus (SARS-CoV) waned over time. (4–9) However, disappearance of anti–SARS-CoV Abs does not necessarily indicate loss of protection. As is well known, an efficient line of defense against viral reinfection consists of three key components: preexisting Abs, memory B cells, and memory T cells. Humoral memory (i.e., secretion of specific protective Abs over long periods in the apparent absence of the Ag) provides the host with a first line of defense against reinfection, constituting protection against a range of pathogens (10). For SARS-CoV infection, however, only a limited duration and limited level of humoral response could be elicited after natural infection (4, 5). In the absence of another SARS outbreak, we cannot deduce whether lower or even undetectable levels of specific Abs would be adequate to protect a person from reinfection by a potential anamnestic response. As seen with other viral infections such as measles and hepatitis A, memory B cells play an essential role in driving the rapid anamnestic Ab response that occurs after reexposure to Ag, even after levels of circulating Abs disappear, which can either completely prevent disease or greatly alleviate the severity of clinical manifestation (10). Human memory B cell response was supposed to be long-lived, but different viral infections lead to variety in the longevity of memory cells. Specific memory B cell response to variola virus could last for >50 y in immunized individuals (11). Patients surviving smallpox were thought to obtain life-long protection against reinfection (12, 13). It is unclear whether a potential anamnestic B cell response exists to protect a person from reinfection after reexposure to SARS-CoV. Of course, T cell responses are known to play their roles in protection against many viral infections and in supporting an anamnestic Ab response, because the anamnestic response of B cells depends on Ag-specific memory CD4+ T cells for rapid reactivation and differentiation into Ab-secreting cells (14). Cellular immune responses to SARS-CoV were confirmed in both SARS patients and experimental animals (15, 16), Memory T cell responses were detected in patients recovering from SARS 1, 2, and even 4 y later, although with a clear decline over time (17–19). Whether the memory T cell response will be maintained at a detectable level thereafter remains to be investigated. The objectives of this study were to estimate the longevity of specific Ab against SARS-CoV, to measure the memory B cell and T cell responses in patients recovering from SARS, and to identify the factors possibly correlated with the specific immune responses. Three groups of subjects were included; that is, a cohort of convalescent SARS patients, close contacts of former SARS patients, and healthy controls. The SARS patients were originally seen at one hospital in Beijing, which had been described in our previous studies (4, 6). All the patients were clinically diagnosed according to the World Health Organization criteria (20) and then confirmed by serological tests. The recovered patients were followed for 6 y. Physical examination was performed and sera samples were collected at each visit. At the last visit (6 y after disease), PBMCs were also isolated from anticoagulated blood by Ficoll-Hypaque density gradient centrifugation. The mean (±SD) age of the recruited 23 patients was 31.7 ± 8.3 y (range, 20–51 y), and 17 (73.9%) were females. Nine patients had underlying disease, including tuberculosis (n = 3), heart disease (n = 2), Pseudomonas aeruginosa infection (n = 2), high blood pressure (n = 1), diabetes (n = 1), and septicemia (n = 1), and seven patients had a severe illness according to revised criteria (20). The 22 close contacts (10 males and 12 females, ages 26–49 y) were health care workers that had been in contact with confirmed SARS patients in 2003. The 20 healthy controls (10 males and 10 females, ages 21–40 y) were individuals from a nonepidemic area who had never been exposed to SARS-CoV. All the volunteers in the two control groups were negative for IgG Ab to SARS-CoV. PBMCs were obtained from each subject and used for the assays of B and T cell responses. The study was approved by the Chinese National Center for AIDS Prevention and Control Institutional Review Board, and written informed consent was obtained from all the cases and controls. The sera were separated and tested for their anti–SARS-CoV IgG response using commercially available ELISA kits (no. S20030003; BJI-GBI Biotechnology, Beijing, China) as described previously (7). The 96-well polystyrene microtiter plates were coated with 10 μg/ml pure coronavirus Ag (SARS-CoV BJ01 strain, accession no. AY278488 in GenBank) for detection. The inactivated SARS-CoV was able to preserve the immunogenicity of S protein including its major neutralizing domain according to the previous study (21). The ELISA process was strictly performed exactly as described in the previous study (7), by the same group using the same kit, to ensure the consistency of the multiple tests. PBMCs from three groups of subjects were plated in 24-well dishes at 5 × 105 cells/well in R-10 supplemented with a mix of polyclonal mitogens: 1/100,000 PWM extract (Sigma-Aldrich, St. Louis, MO), 6 μg/ml phosphothiolated CpG ODN-2006 (22) (manufactured by Beijing AuGCT Biotechnology), and 1/10,000 Staphylococcus aureus Cowan (Sigma-Aldrich). Twelve wells to 24 wells were cultured per individual. A negative control well was cultured in R-10 alone. Cells were cultured for 6 d at 37°C in 6–8% CO2. In preparation for the ELISPOT assay, 96-well filter plates were coated overnight with SARS Ag (Inactivated SARS-CoV vaccine; Sinovac Biotech, Beijing, China) diluted 1/5 in PBS. Keyhole limpet hemocyanin (2.5 μg/ml; Pierce Biochemicals) was used as a negative control Ag. To detect all IgG-secreting cells, a separate plate was coated with 10 μg/ml goat anti-human Ig (Caltag Laboratories, Burlingame, CA). Plates were washed and blocked with RPMI 1640 plus 1% BSA (fraction V; Sigma-Aldrich) for 2–4 h at 37°C before use. Cultured PBMCs were washed thoroughly, plated onto ELISPOT plates, and incubated for 5–6 h at 37°C in 6–8% CO2. Detection reagents were mouse anti-human pan IgG Fc biotin-conjugated Ab (B1140; 1:20,000; Sigma-Aldrich) in PBS plus 0.05% Tween 20 plus 1% FCS, followed by HRP-conjugated avidin D (S2438; Sigma-Aldrich), and developed using 3-amino-9-ethylcarbozole (Sigma-Aldrich). Spot-forming cells (SFCs) were detected with ELISPOT image analysis system (Cellular Technology). Data are represented as the frequency of SARS-specific B cells as a percentage of the total IgG memory B cells in PBMCs. The ELISPOT assay for memory B cell measurement was established according to the methods developed by Crotty et al. (22) and was further validated in three aspects. First, we immunized mice with the SARS vaccine and then used the same vaccine Ag to detect bone marrow plasma cells a month later. A positive result clearly demonstrated the feasibility of using this vaccine as Ag for these assays. Second, influenza-specific memory B cell response was pretested using the PBMCs of influenza vaccine recipients; the positive results also validated the whole process of the ELISPOT assay. Because the majority of SARS patients had received tetanus toxoid vaccine, we chose to measure specific memory B cell frequencies using the tetanus toxoid as Ag, side by side with SARS Ag, on six recovery SARS patients with sufficient PBMC samples. We finally detected positive memory B cell response to tetanus toxoid, instead of to SARS Ag, therefore validating our negative results on recovered SARS patients (Supplemental Fig. 1). Based on the fact that IFN-γ was the predominant cytokine produced by T cells after stimulation with peptides (18), we performed IFN-γ ELISPOT assay with overlapping synthetic peptides (total 20 peptides, 17mers overlapping by 9 aa residues) spanning the immunodominant site IV S protein of SARS-CoV. As described in the previous publication (23), the used peptide pools, which overlap the site IV sequence in the S protein, were identified to react with the convalescent sera of former SARS patients but with none of the samples from healthy blood donors, suggesting the justification for their use in eliciting SARS-CoV specific memory T cell response. ELISPOT assay kit for IFN-γ was purchased from BD Biosciences and performed as instructed. Briefly, 96-well plates (Millipore) were coated with anti–IFN-γ capture Ab at 4°C overnight. The plates were washed three times before blocking with complete culture medium. Fresh PBMCs were plated at 2 × 105 cells per well in triplicate. Peptides and costimulatory mAbs to CD28 and CD49d were added. PBMCs stimulated with PHA were used as positive controls, and PBMCs not stimulated were used as negative controls. After incubation for 16–20 h at 37°C in 6–8% CO2, the supernatants were harvested and assayed for IFN-γ production by ELISA according to the manufacturer’s protocol (BD Pharmingen). The cells were removed and incubated with biotinylated anti-human IFN-γ detection Ab for 2 h at 37°C. After washing, wells were developed for 1 h with streptavidin–HRP and incubated with substrate reagent according to the manufacturer's protocol. The frequency of IFN-γ–producing cells was calculated as the number of spots/number of total PBMCs per well and was adjusted as the number of IFN-γ–producing cells/2 × 105 PBMCs. The number of spots in negative control wells was at a range of 0–5 spots. Wells containing spot numbers greater than the mean ± 3 SD of three negative control wells (no peptide) were regarded as positives in each individual, provided that the total was >5 SFCs/million PBMCs to rule out false positives where background was very low. Before final analysis, Ab data were censored by excluding subjects who were visited less than three times during the whole process. In the case of undetectable Ab, an arbitrary value of 1:5 was assigned to allow for calculation of the geometric mean titer. Differences in continuous variables levels or proportions were tested using t test, one-way ANOVA, or χ2 test, where appropriate. Non-parametric Spearman's test was performed for correlation analysis. Geometric means of memory cell levels were compared between groups by t test of log-transformed values. A p value <0.05 was considered to be statistically significant. All the data were processed using SAS version 9.1 (SAS Institute) and Microsoft Excel 7.0. Six years postinfection, specific IgG Ab to SARS-CoV turned undetectable in 21 of the 23 recovered patients with only 2 patients maintaining low levels of IgG Ab. Fig. 1 shows the kinetics of IgG Ab titers of the two patients by months since onset of SARS symptoms in comparison with the changes in IgG Ab levels of the patients as a whole. The IgG Ab of patient A was 1:256 when discharged from the hospital and diminished gradually thereafter to 1:20 at month 72 since disease onset, which followed a similar pattern as that of the whole group of patients, whereas patient B maintained a low (1:40) but stable level of specific IgG Ab during the 6-y follow-up period. 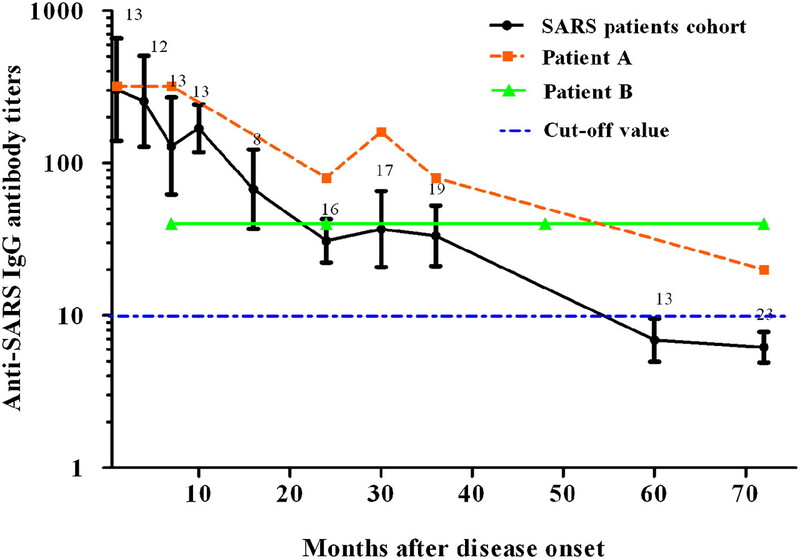 Dynamic changes in specific IgG Ab against SARS-CoV in patients who recovered from SARS. The geometric mean reciprocal titers (black line) are shown for the IgG Ab of the group of patients. The number of serum samples tested at each visit is given in the figure. The IgG titers of patient A (red line) and patient B (green line) are demonstrated. PBMCs from 23 recovered SARS patients, 22 close contacts, and 20 healthy controls were tested for B responses with PWM and SARS-CoV Ag as stimulation, respectively (Fig. 2A). As a result, the nonspecific B cell responses, presented as the total of B cells producing IgG, were not significantly different (one-way ANOVA, p = 0.948) (Fig. 2B). 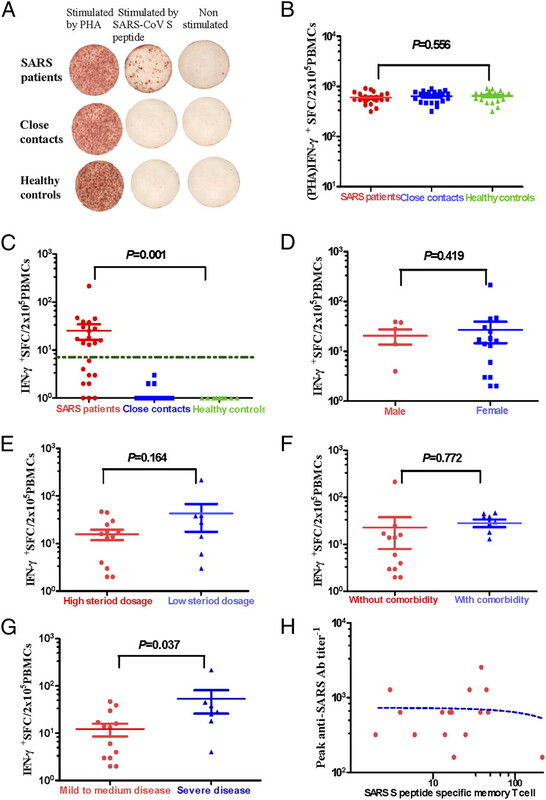 When the PBMCs were stimulated with SARS-CoV Ag, no specific B cell response was detected in the patient group or close contact and healthy control groups (Fig. 2A). Two paired PBMC samples from two SARS patients in another SARS cohort, which were collected 3 mo postinfection and 3.5 y after recovery, were used to perform the same ELISPOT assays simultaneously. The positive specific B cell response in the acute samples and negative response in late samples further proved that the system was capable of detecting SARS-specific memory B cell responses (Supplemental Fig. 1). Comparison of total IgG+ memory B cell and SARS-CoV specific memory B cell response among 23 former SARS patients, 22 close contacts, and 20 healthy controls. A, Total IgG+ and SARS-CoV Ag-specific memory B cells were measured and are shown as representative results from the former SARS patients, close contacts, and healthy controls. B, Total IgG+ memory B cell counting in three groups; no significant difference was observed. Memory T cell responses were tested using ELISPOT assay in 23 recovered SARS patients, 22 close contacts, and 20 healthy controls. When stimulated with PHA, PBMCs from the three groups presented high frequency of IFN-γ–forming cells (Fig. 3A), with no significant difference observed (one-way ANOVA, p = 0.556) (Fig. 3B). When stimulated with SARS-CoV peptides, 14 of 23 (60.9%) recovered patients demonstrated specific memory T cell responses (Fig. 3C). In contrast, neither close contacts nor healthy controls showed a detectable T cell response. The number of SFCs ranged from 1 to 216 with an average of 37 ± 51 per 2 × 105 PBMCs in the former SARS patients, which was significantly higher than those from close contacts (SFCs 0–2) and healthy controls (SFCs = 0) (one-way ANOVA, p = 0.001) (Fig. 3C). We then compared the memory T cell levels of the recovered patients in relation to the factors that might affect host immunity. No statistically significant difference of memory T cell response was observed between male and female patients or between high and low steroid dosage groups (Fig. 3D, 3E). The patients with comorbid conditions seemed to have a higher T cell response level than that of patients without comorbidity, but the difference was not significant (Fig. 3F). The patients presenting severe clinical manifestations showed significantly higher memory T cell responses to SARS-CoV than those of others (Fig. 3G, t = 2.222, p = 0.037). Because no SARS-specific memory B cell was detected and only two patients had detectable IgG Abs, the association between memory T and B cell responses could not be measured. We then compared peak serum IgG titers and memory T cell frequencies of each patient (Fig. 3H) and found no significant correlation between them (Spearman correlation analysis, r = 0.208, p = 0.392). Memory T cell responses to SARS-CoV by ELISPOT assay among 23 former SARS patients, 22 close contacts, and 20 healthy controls at 6 y postinfection. A, PBMCs were stimulated with PHA and SARS-CoV S peptides. B, PBMCs from convalescent SARS patients and control groups were stimulated with PHA. The average number of IFN-γ–releasing cells was calculated, and the bars represent 95% confidence interval. C, SARS S peptide-specific memory T cell responses from recovered SARS patients and control groups. D, SARS S peptide-specific memory T cell counts of male (n = 6) and female (n = 17) patients. E, SARS S peptide-specific memory T cell counts of patients with low- to medium-dose steroid use (n = 15) and high-dose steroid use (n = 8). F, SARS S peptide-specific memory T cell counts of patients without comorbidity (n = 14) and with comorbidity (n = 9). G, SARS S peptide-specific memory T cell counts of patients with mild to medium illness (n = 16) and severe illness (n = 7). H, Peak serum IgG Ab titer plotted against SARS-specific memory T cell frequency. Spearman correlation analysis, r = 0.208, p = 0.392. Although 6 y have passed since the outbreak of SARS in 2003, there are still many unsolved mysteries and scientific problems regarding this emerging infectious disease. One of the major concerns is how long the protective immunity will be maintained in individuals after SARS-CoV infection. It is believed that both specific IgG Abs and neutralizing Abs are important to protect hosts from viral reinfection, often in combination with cellular immunity (24). In this study, a group of serologically confirmed SARS patients were followed for 6 y to observe the dynamic changes in specific IgG Abs. As seen in our previous studies (4, 6), the humoral immunity continuously declined over time and eventually vanished in most patients. Only 2 of 23 patients maintained a low level of IgG Ab 6 y after disease onset. Numerous previous studies have demonstrated that the titers of neutralizing and IgG Abs are well correlated throughout the follow-up period (4, 6, 9). Although we did not test the neutralizing Ab to SARS-CoV in this study because the culture for SARS-CoV is restricted for the sake of biosafety, the IgG Ab could be a reliable indicator of neutralizing Ab for understanding the humoral response to SARS-CoV infection. The findings of these studies imply that naturally acquired humoral immunity of SARS patients persists for a limited period of time, which brings forward another question whether waning specific Abs would be adequate to protect a person from reinfection by a potential anamnestic response, as seen with many other viral infections. To answer the above question, we measured the memory B cell and T cell responses against SARS-CoV in former SARS patients. To our knowledge, this is the first published study on memory B cell response to SARS-CoV and the first report of memory T cell response as long as 6 y after natural infection. In this study, no circulating SARS-CoV Ag-specific memory B cell response was detected in recovered SARS patients by using the ELISPOT method. The peripheral memory B cell response was even not detected in the two patients who maintain low levels of specific IgG Ab. Also, we were able to demonstrate positive and negative SARS-specific memory B cell responses in two paired samples, thus verifying the negative results in the 6-y convalescent patients. The lack of specific memory B cell response in the patients 6 y after disease onset implies that SARS-CoV infection is different from many other viral infections in which memory B cells are able to produce sufficient Abs promptly in response to reexposure and also replenish long-lived plasma cells to maintain long-term Ab levels that can neutralize viruses. A representative example is that the memory B cells generated by smallpox vaccination could be detected even 40–50 y after immunization (25). In contrast, short-lived memory B cell responses have been observed in influenza and HIV infections, in which persistent low level of viral replication is not adequate to maintain specific memory B cells (26). In antiviral defense, B cells are supposed to play a central role by providing protective natural Abs in the first line, humoral memory Abs in the second line, and reactive memory B cells in the third line. In the absence of chronic immune reactions, maintenance of humoral memory and most serum Abs are supposed to be derived from long-lived plasma cells of the bone marrow (27–29). Long-lived plasma cells in a human are thought to live for decades (30), which can totally provide alternative protection besides memory B cells. The current study only assessed polyclonal activation of memory B cells in vitro. Further studies are required to examine the memory B cells possibly residing in other parts of the body such as bone marrow and secondary lymphoid organs. However, the absence of peripheral memory B cells might reflect, to certain extent, the low or even undetectable level of memory B cell in bone marrow, as the latter seemed to be the major source of peripheral memory B cells. Our results demonstrated that SARS-CoV–specific memory T cells persisted in peripheral blood of recovered SARS patients. In comparison with memory B cells, memory T cells are usually present with higher numbers and usually elicited in faster responses and better location (31), but they are not necessarily protective (32). Previous studies in animal models and clinical observation demonstrated that memory T cells did contribute to protective immunity against influenza viruses but could only be attained in concert with the H1-specific plasma cells and memory B cells rather than memory T cells alone (14). B cell responses to influenza vaccination in HIV-infected individuals dropped with the decrease of CD4+ cells (33). The relative importance of memory B cells as well as long-lived plasma cells or memory T cells in protective immunity of SARS-CoV infection remains to be investigated. In the study, we also found that patients with severe disease demonstrated increased memory T cell responses. Another study reported that the frequency of memory CD4+ T cells was significantly higher in patients with severe SARS in comparison with those with mild-to-moderate illness (17). The severe illness was also associated with a more robust IgG response (7, 9). An appealing and well-accepted explanation for these findings is that an overexuberant host response might be associated with worsening of disease and progressive lung damage (34, 35), yet this overreaction might not be a long-lasting one. The limitation of the study should be addressed. The matched samples were only available from two patients because of the difficulty in acquiring samples, therefore more convincing data should be obtained to demonstrate the lack of SARS-specific memory B cells long after infection. The lack of additional experiments, for example, the tests on memory B or T cell-type cytokines, purified B and T cells/cell subsets, and so forth, due to the limited accessible samples, made further evaluation of immune response impossible. These two points are the major limitations of the study and should be addressed in future investigations. In conclusion, specific IgG Ab to SARS-CoV eventually vanish in most SARS patients. Peripheral memory B cell responses are undetectable in all the patients. However, quite a portion of the patients maintain T cell memory even 6 y postinfection. Whether the T cell anamnestic response is adequate to protect a person from reinfection requires further investigation. The findings are expected to have implications for disease management and surveillance in case of disease reemergence. It would also be important for making a decision on vaccination strategy, as vaccine is supposed to be the most effective way to confer active and sustained protection against a future reemergence of SARS. We are grateful to Dr. Shi-Xia Wang and Dr. Shan Lu from the University of Massachusetts Medical School for help in ELISPOT assays. This work was supported by grants from the National Science Fund for Distinguished Young Scholars (Grant 30725032), the Commission of the European Community as part of the project “Effective and Acceptable Strategies for the Control of SARS and New Emerging Infections in China and Europe” (Contract 003824), and the Beijing Science and Technology NOVA Program (2007A066).
. 2004. Severe acute respiratory syndrome. Clin. Infect. Dis. 38: 1420–1427.
. 2003. The severe acute respiratory syndrome. N. Engl. J. Med. 349: 2431–2441.
. 2004. Severe acute respiratory syndrome. Curr. Opin. Infect. Dis. 17: 143–148.
. 2007. Disappearance of antibodies to SARS-associated coronavirus after recovery. N. Engl. J. Med. 357: 1162–1163.
. 2007. Duration of antibody responses after severe acute respiratory syndrome. Emerg. Infect. Dis. 13: 1562–1564.
. 2006. Two-year prospective study of the humoral immune response of patients with severe acute respiratory syndrome. J. Infect. Dis. 193: 792–795.
. 2006. Antibody responses against SARS coronavirus are correlated with disease outcome of infected individuals. J. Med. Virol. 78: 1–8.
. 2005. Longitudinally profiling neutralizing antibody response to SARS coronavirus with pseudotypes. Emerg. Infect. Dis. 11: 411–416.
. 2006. Anti-SARS-CoV IgG response in relation to disease severity of severe acute respiratory syndrome. J. Clin. Virol. 35: 179–184.
. 2007. Antibodies and B cell memory in viral immunity. Immunity 27: 384–392.
. 2007. Duration of humoral immunity to common viral and vaccine antigens. N. Engl. J. Med. 357: 1903–1915.
. 2002. Diagnosis and management of smallpox. N. Engl. J. Med. 346: 1300–1308.
. 2003. Cutting edge: long-term B cell memory in humans after smallpox vaccination. J. Immunol. 171: 4969–4973.
. 1996. Immunological memory and protective immunity: understanding their relation. Science 272: 54–60.
. 2004. A DNA vaccine induces SARS coronavirus neutralization and protective immunity in mice. Nature 428: 561–564.
. 2005. Identification of murine CD8 T cell epitopes in codon-optimized SARS-associated coronavirus spike protein. Virology 335: 34–45.
. 2008. T cell responses to whole SARS coronavirus in humans. J. Immunol. 181: 5490–5500.
. 2009. Characterization of SARS-CoV-specific memory T cells from recovered individuals 4 years after infection. Arch. Virol. 154: 1093–1099.
. 2006. Long-lived effector/central memory T-cell responses to severe acute respiratory syndrome coronavirus (SARS-CoV) S antigen in recovered SARS patients. Clin. Immunol. 120: 171–178. World Health Organization. Case definitions for surveillance of severe acute respiratory syndrome (SARS). Available at: http://www.who.int/csr/sars/casedefinition/en. Accessed: June 6, 2003.
. 2004. Antibody response and viraemia during the course of severe acute respiratory syndrome (SARS)-associated coronavirus infection. J. Med. Microbiol. 53: 435–438.
. 2004. Tracking human antigen-specific memory B cells: a sensitive and generalized ELISPOT system. J. Immunol. Methods 286: 111–122.
. 2004. Identification of immunodominant sites on the spike protein of severe acute respiratory syndrome (SARS) coronavirus: implication for developing SARS diagnostics and vaccines. J. Immunol. 173: 4050–4057. 2002. Antibodies, viruses and vaccines. Nat. Rev. Immunol. 2: 706–713.
. 2003. Duration of antiviral immunity after smallpox vaccination. Nat. Med. 9: 1131–1137.
. 2004. Detection and enumeration of circulating HIV-1-specific memory B cells in HIV-1-infected patients. J. Acquir. Immune Defic. Syndr. 35: 114–119.
. 1997. Lifetime of plasma cells in the bone marrow. Nature 388: 133–134.
. 1998. Humoral immunity due to long-lived plasma cells. Immunity 8: 363–372.
. 1992. Germinal centers and antibody production in bone marrow. Immunol. Rev. 126: 99–112.
. 2004. Immunological memory in humans. Semin. Immunol. 16: 197–203.
. 2006. Differentiation of memory B and T cells. Curr. Opin. Immunol. 18: 255–264.
. 1999. A comparison of T cell memory against the same antigen induced by virus versus intracellular bacteria. Proc. Natl. Acad. Sci. USA 96: 9293–9298.
. 2005. Compromised B cell responses to influenza vaccination in HIV-infected individuals. J. Infect. Dis. 191: 1442–1450.
. 2003. Lung pathology of fatal severe acute respiratory syndrome. Lancet 361: 1773–1778.
. 2003. Severe acute respiratory syndrome: radiographic appearances and pattern of progression in 138 patients. Radiology 228: 401–406.